2019 Kawasaki KX250. Picture credits - Kawasaki. Submit more pictures. 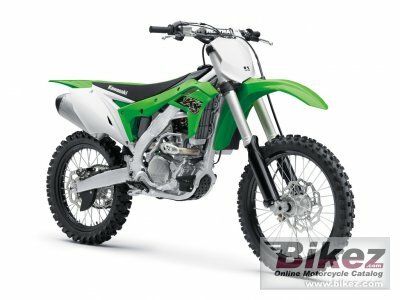 The KX design philosophy � to put mid-level to expert riders on the top step of the podium � has not changed since the brand was launched over 40 years ago. The KX250 has a history of winning: in the extremely competitive 4-stroke 250cc class it is the racer with the most AMA Supercross and Motocross titles. Adding to its highly acclaimed engine and chassis performance, numerous industry firsts and advanced technology, the 2019 model offers a powerful engine, a light chassis, and matched with the slim ergonomics, making the 2019 model the most competitive KX250 yet. Ask questions Join the 19 Kawasaki KX250 discussion group or the general Kawasaki discussion group. Enter your e-mail to join the 2019 Kawasaki KX250 forum and get notification of answers and new messages about this bike. You can unsubscribe with a single click. Bikez does not display, sell	or misuse e-mail addresses. Bikez has discussion forums for every bike. View comments, questions and answers at the 2019 Kawasaki KX250 discussion group. You can sign up for e-mail notifications when other riders answer you. If you have extensive experience with the MC, please send us a review. If you consider buying this bike, you should view the list of related motorbikes Look at photos. Compare technical specs. And check out the rating of the bike's engine performance, reliability, repair costs, etc. You can compare the rating with other bikes.